Returning any Formula One team from the brink of financial ruin is a difficult one, but to do so when the team has already been put in administration and had some of its assets sold, is quite remarkable. A few days ago the announcement came through that the team intended to race in Melbourne having come out of administration, with the team receiving financial backing from Stephen Fitzpatrick (Ovo Energy) and re-structuring its debts. But wait didn't Force India block them from using a 2014 car for the forthcoming season? Force India were the only ones that needed to vote in Strategy Group meeting, had they said yes another no vote down the chain from one of the others would have been enough to veto the move anyway. 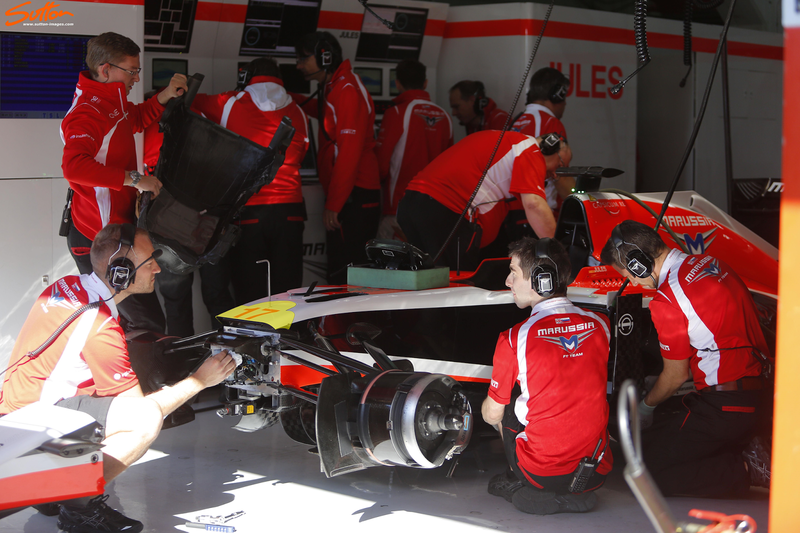 Manor-Marussia will therefore arrive in Melbourne with an MR03 that has been adapted to 2015 regulations. Initially when I considered adaptation of the 2014 chassis I thought it may prove a bridge too far for the team. 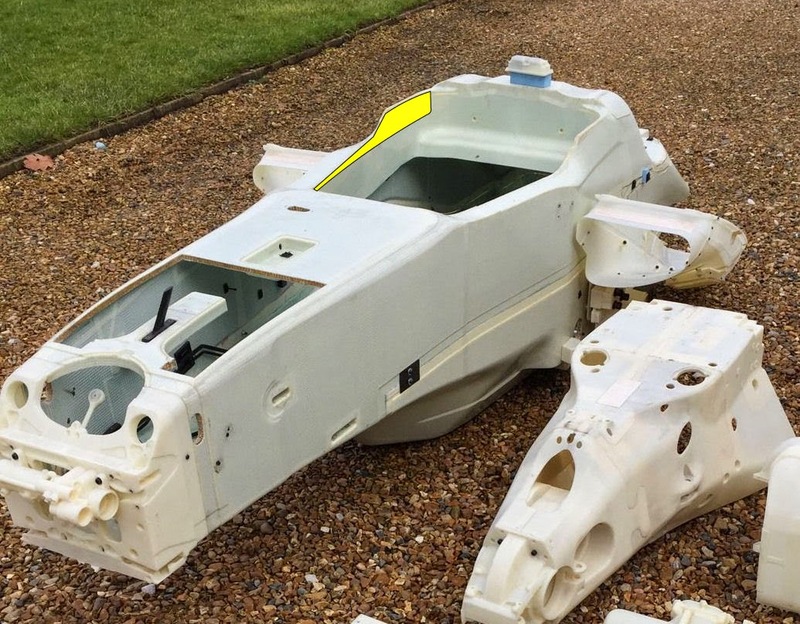 I then remembered that they'd had to apply the changes to the chassis (525mm (A-A)/625mm (B-B) above the reference plane) for their 2014 challenger. Having looked more extensively at pictures of the MR03 over the last few days and the proposed 2015 wind tunnel model it has become clear that there isn't such a problem in making the MR03 2015 compliant. The biggest issue is the transition (see above, highlighted in blue), although the MR03 chassis is 2014/15 compliant their 2015 design featured a much longer transition, meaning their nose design will require some adaption. As we can see in the image above of the MR03 the transition from the 625mm at B-B to 525mm at A-A was relatively steep. The 'vanity' panel that the team used to traverse the gap can be seen resting upside down on the chassis or for reference mounted in the image below (highlighted in yellow). Interestingly the MR03's forward section of the chassis is separate from the rest of the carbon layup, making it detachable and therefore makes changes possible too (see the highlighted area below). 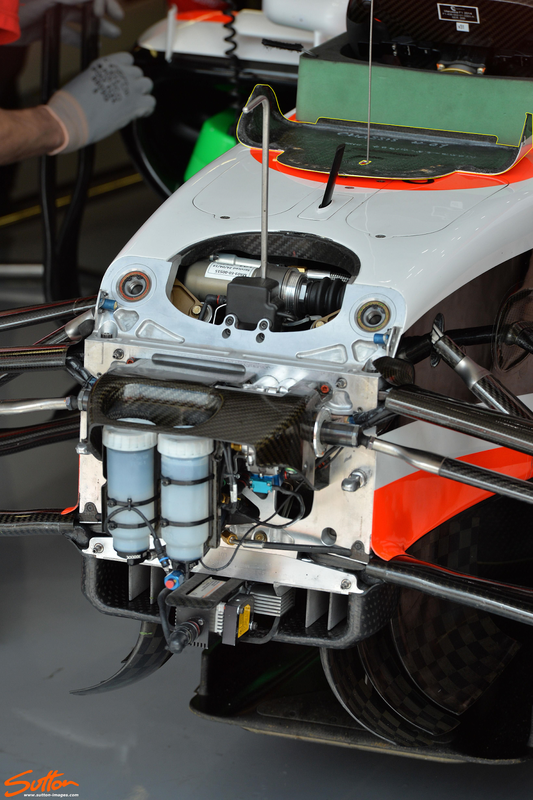 The image below is of the mockup of the MR03, in this we can see more definition of the metallic forward element. The team perhaps opted for this route knowing it would be easier to recast this part should they feel the need to change their suspension geometry, etc during the 2014 season. Thinking along these lines it would make the same viable for the team as they look to extract performance from the MR03 for 2015. The other change for 2015 when comparing the chassis regulations is the increased height of the zylon intrusion panels (Highlighted in yellow is section that has been added). b) In a vertical sense, cover the area lying between two horizontal planes 100mm and 550mm above the reference plane. 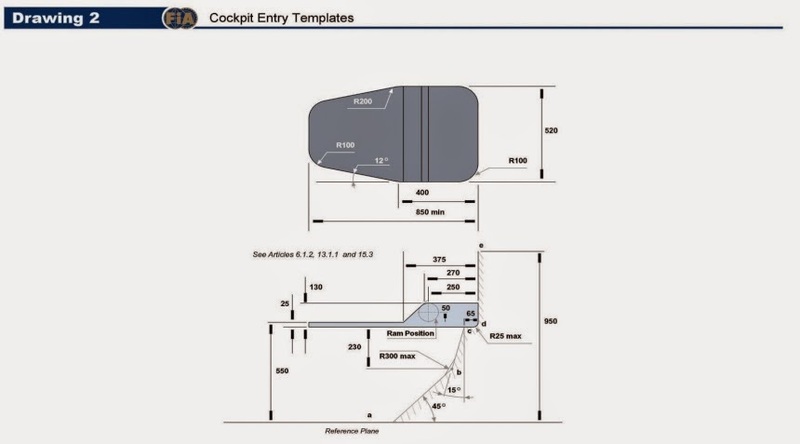 Furthermore, when viewed from the side, the panel must cover the cockpit entry template shown in side elevation in Drawing 2. Behind a vertical line which lies 375mm forward of the rear edge of the cockpit entry template a 20mm taper may be included at the top edge of the panel. 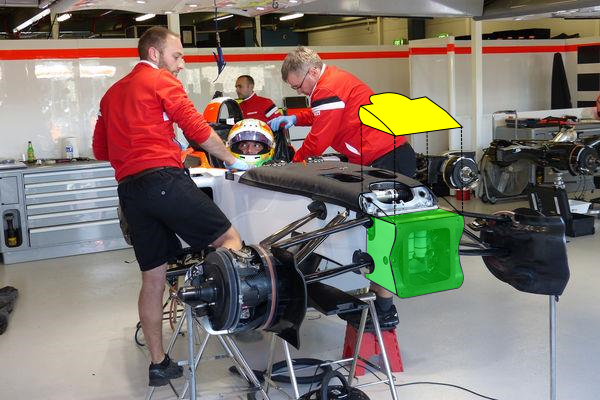 I've marked (in yellow) roughly the area that the zylon panels need to reside on the image of the MR03 mockup below. As per the technical regulations they'll need to be 6.2mm thick and made of at least 16 zylon plies and two plies of carbon. Section d) implies that these panels need to be permanently attached to the survival cell with an appropriate adhesive. Suffice to say the changes needed to make the survival cell compliant are not insurmountable, especially for an F1 team, even if they're a little depleted in numbers. The question however for me now though, is not whether the team can make the grid in Melbourne (especially as they've now passed the crash tests and the freight is loaded) but whether they can achieve a time within 107% to race. This will come down to several factors, one of which the team are yet to announce; their other driver. In terms of the MR03-B as I'm calling it for now, we know the team will have to settle with a half-way house design for their nose. This will be a blow in terms of numbers when compared to the stillborn MR04, but it's believed the team had already invested time in testing interim parts on the MR03, so know what sort of numbers they'll be looking at in any case. The MR04 may have provided the team with a much needed jump forward but for now that'll have to wait until around Silverstone at the earliest, as the team continue to restructure. Providing the team can stay on the edge of the 107% I suspect they'll throw what they can at the 2015 car rather than providing too many updates for the MR03-B. I do suspect they may have updates for the MR03-B in Melbourne, taking cues from the developments the new car was supposed to carry, especially in terms of front wing, floor, diffuser and rear wing evolution. 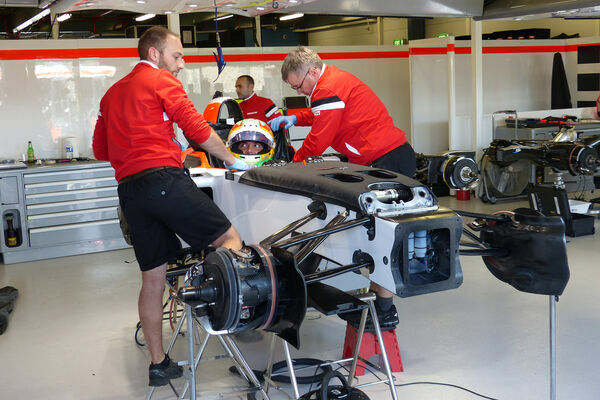 I'll be keeping a keen eye on Manor throughout the season, as their development curve will be interesting to watch and as always I'll keep you informed of the changes at hand. Appears Manor have opted to use a spacer in front of the bulkhead (highlighted in green) to lengthen the transition area, giving them more scope in terms of nose design. 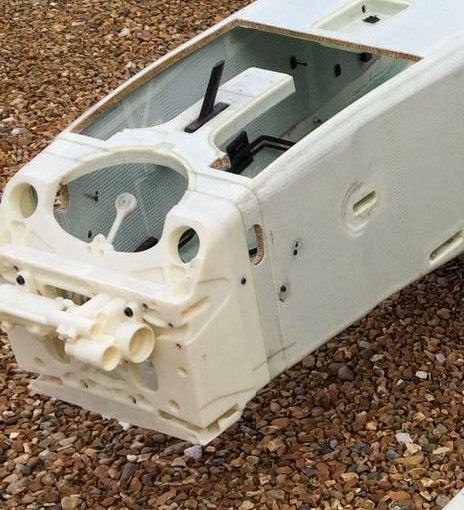 This will of course have its own compromises and means the nose box (crash structure) may be longer than they'd ideally like it, in order to get it through the crash test. I've also marked the likely shape/size of the new vanity panel that covers the transition.